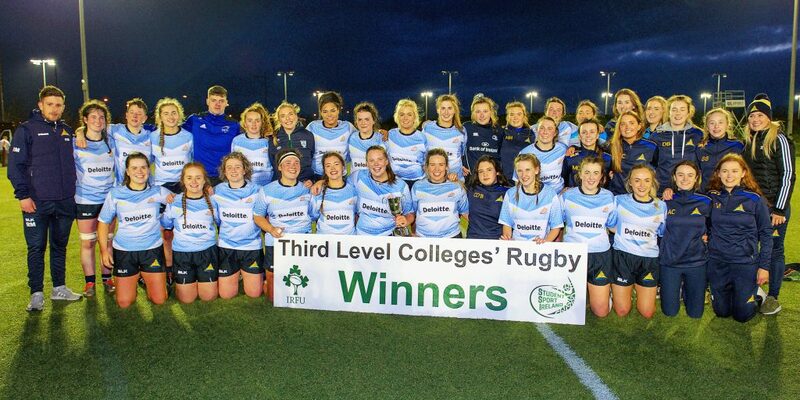 Dublin City University were crowned Student Sport Ireland / IRFU Women’s Rugby Tier 1 Cup champions after a last second penalty try saw them defeat University of Limerick after a classic encounter on the 4G surface in University of Limerick. 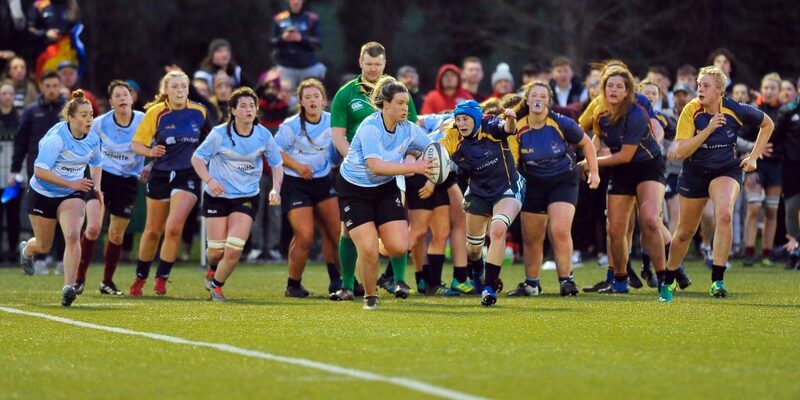 With the success of the leagues in recent years it was decided to add a new cup competition in 2019 to the 3rd level Women’s Rugby calendar and those present on Wednesday night were treated to an incredible game of rugby. The sides had met in last years league final where University of Limerick took the honours, however DCU claimed the league honours this year before Christmas so the scene was set for another fantastic game. The home side UL took the lead inside five minutes as prop Laura Delaney powered her way over the DCU line and the conversion was brilliantly struck by Helen McDermott for a 7-0 lead. Hannah Heskin replied within five minutes for DCU with a try, before a Helen McDermott penalty kick put UL 10-5 in front. Before half time Hannah Heskin crossed the white wash for her second try of the game as the sides went to the changeover tied at ten points each. DCU took the lead for the first time in the game early in the second half when Anna Doyle touched down, but the response was immediate from UL as Rebecca Doohan got over for a try. With two senior Irish internationals on the field Emma Hooban (DCU) and Enya Breen (UL) who both lined out in the Six Nations it showed the standard of players on the field. Anna Doyle put DCU back in front midway through the second half with her second try of the game. UL looked to be on the road to victory with seven minutes remaining as Julie Ingretta touched down to the left of the posts and Helen McDermott converted her third dead ball of the game to give UL a 22-20 lead. DCU were camped on the UL line for the last five minutes and looked to have won the game with a try on the wing but the referee penalised the player in possession for not releasing and it looked like their chance had passed, however a superb turn over and quick ball out to the left wing brought about a over zealous tackle when a try was nailed on and the referee immediately awarded a penalty try before blowing the full time whistle under the posts, to send DCU into ecstasy and UL into heart break. It was a truly memorable game of rugby and both sides were complimented on their skills by Nicky Comyn (Senior Vice President of the IRFU) as he presented the cup to the winning captain Ciara McDonnell who had to be substituted early in the first half with an ankle injury. DCU – Laura Power, Eva Kealy, Katie O’Brien, Emma Lackey, Sophie Kilburn, Maeve Og O’Leary, Aine Reilly, Mairead Hopkins, Jane Waters, Ciara McDonnell (Captain), Eimear Corri, Hannah Heskin, Anna Doyle, Lucinda Kinghan, Kate Cullen, Meabh Donohoe, Emma Hooban, Helen Boylan, Niamh Belton, Aine Lyons, Molly Scuffil McCabe, Keely Doonan, Rachael Mulholland, Louise McCleery, Grainne Gilmore, Alice Carroll, Aoife McGeough, Rachael Armitage, Soha Smyth. UL – Emily McMahon, Rachael Dunne, Laura Delaney, Ciara O’Halloran, Claire Bennett, Jess Hewitt, Clodagh O’Halloran, Monique Sluys, Sinead Hogg, Helen McDermott, Rebecca Doohan, Julie Ingretta, Enya Breen, Sinead O’Leary, Rosie Newton, Deirdre O’Donnell, Roisin McWey, Claire Coghlan, Sarah Garrett, Clodagh Hanniffy, Grainne Lohan, Ellen O’Sullivan, Eadoain Liddy, Meadhbh Lewis, Aine Lucy, Elizabeth McNicholas, Orla Curtin, Melanie McKnight.